Form Description: When your business begins to offer credit to other vendors, or customers, then you need to keep track of whether they are paying those accounts on time. After a while, if they have not paid their bills on time, or as they agreed to, you need to begin the collections process. The first step in that process is to send out a Final Notice of Payment. This Simple Final Notice of Payment is exceptionally easy to use. 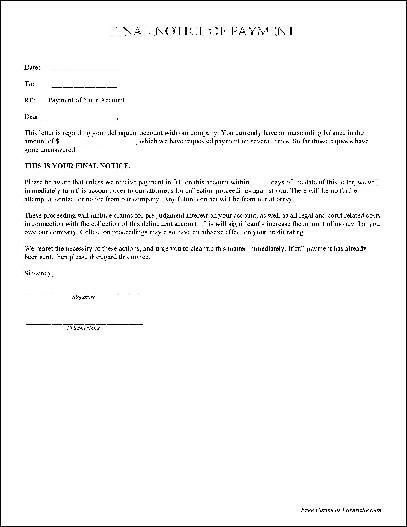 All your business needs to do is fill out the blanks, sign it, make a copy of the notice for your records, and then mail it off. All in all, it really couldn't be simpler. You can download a PDF version of the "Simple Final Notice of Payment" form absolutely free. You can also, for a small payment, download a fully editable version of the form that you can customize as you desire. (Don't know which format to choose? Here's how to make your choice.) What would you like to do? Formville's free "Simple Final Notice of Payment" form is associated with the following keywords: credit, business, dispute, account, simple, final, notice, payment.